To help demonstrate how the new Silcare Breathe liner works and to compare results with a standard silicone liner, we worked with amputee Charlie Lewis to capture the results. Charlie is an Activity Level 4 amputee who regularly runs and cycles. Charlie reports problems with perspiration when training and has tried botox and anti-perspirant lotions with no success. 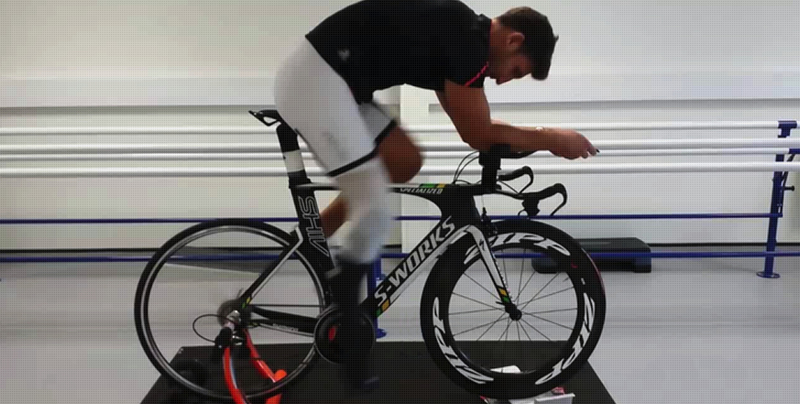 Charlie was asked to cycle for 10 minutes, first wearing a standard silicone liner and then again wearing Silcare Breathe. Instant temperature readings of the residual limb were also taken before and after each session using an infra red thermometer. 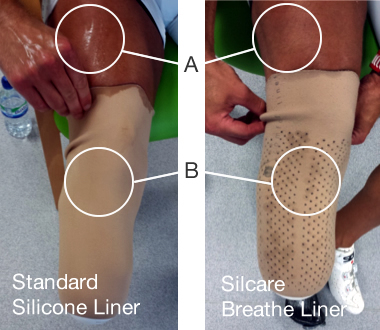 The temperature readings showed that the residual limb was 2°C cooler at the end of the session with the Silcare Breathe liner. At the end of the session, perspiration remained inside the standard silicone liner with some pooling at the bottom of the liner. The perspiration was clearly visible on Charlie’s residual limb (point A). This forced Charlie to stop the activity to empty and dry the liner and his residual limb. With the Silcare Breathe liner, perspiration had visibly escaped through the holes (point B) leaving Charlie’s residual limb dryer and feeling more secure.